Fortnite challenges work a little differently in season five. Previously, you had to purchase a Battle Pass to access any of them, but now three — which can earn you 20 Battle Stars — are available for free. Assault rifles are everywhere in Battle Royale, and you probably use them more than any other weapon. That makes this challenge pretty easy. 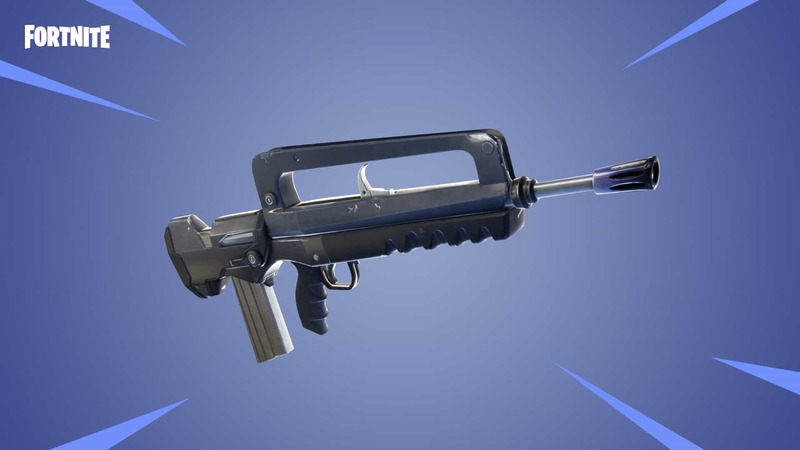 All you need to do is deal 1,000 damage using either the standard assault rifle, the burst assault rifle, the three-burst assault rifle, the scoped assault rifle, the thermal-scoped assault rifle, or the Scar. You don’t have to deal 1,000 damage in one game, so you can take your time. If you die early, just keep trying. This challenge is a little trickier because you do have to complete it in one match, but searching seven ammo boxes won’t be too difficult if you land in the right places. Aim for built-up areas where there are plenty of buildings, and you should find at least one ammo box in each one. Greasy Grove is ideal because it’s not normally too busy. Pleasant Park, Lonely Lodge, Salty Springs, and similar locations are also good choices. Paradise Palms is insanely popular right now because it’s a brand new location in season five. That means you’re guaranteed to run into opponents when you land there. Grab a decent gun and shields as soon as possible (aim for chests if you know where they’re located) and then hunt down other players. Aim for buildings, where most people will be looting, and you should end up with three eliminations in no time. If you struggle with this challenge because you’re dying early, try to land in the buildings on the outskirts of Paradise Palms so that you can loot alone. Once you’re comfortable with your load-out, you can venture into the city carefully and pick people off. This challenge might take you a few matches, but it should be relatively simple. All you need to do is score a basket on five different hoops, which you’ll find located all over the Battle Royale map. 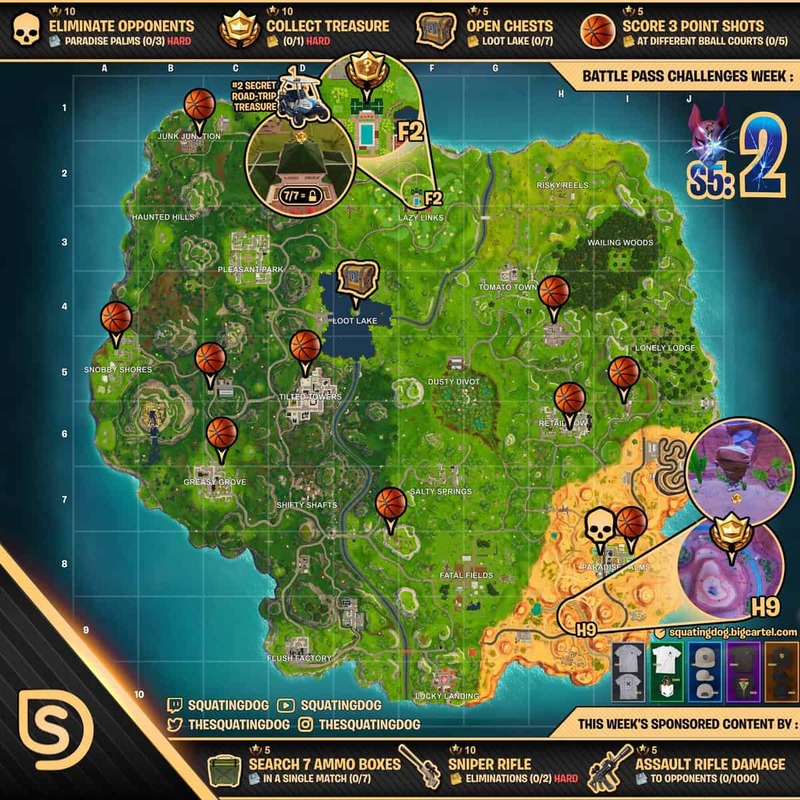 The map below, courtesy of @TheSquatingDog, shows you where all basketball hoops are located, which should make this a little easier. But there’s a catch: To score a basket, you need the basketball emote. 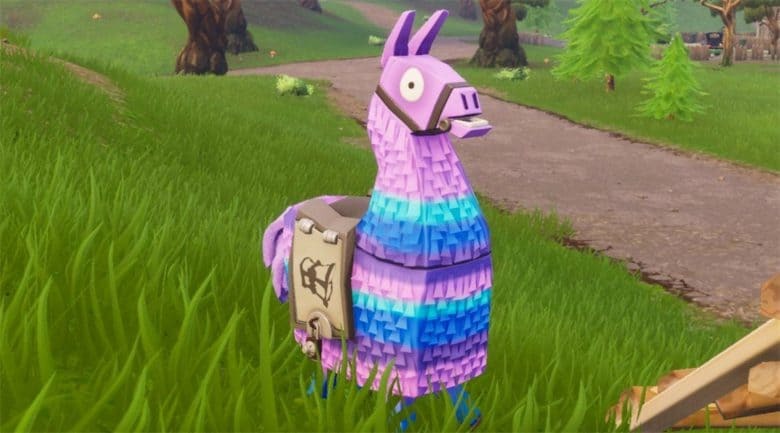 This isn’t unlocked until you reach tier 13 in season five’s Battle Pass. If you’ve only just started out, then, you’ll have to wait a little while. 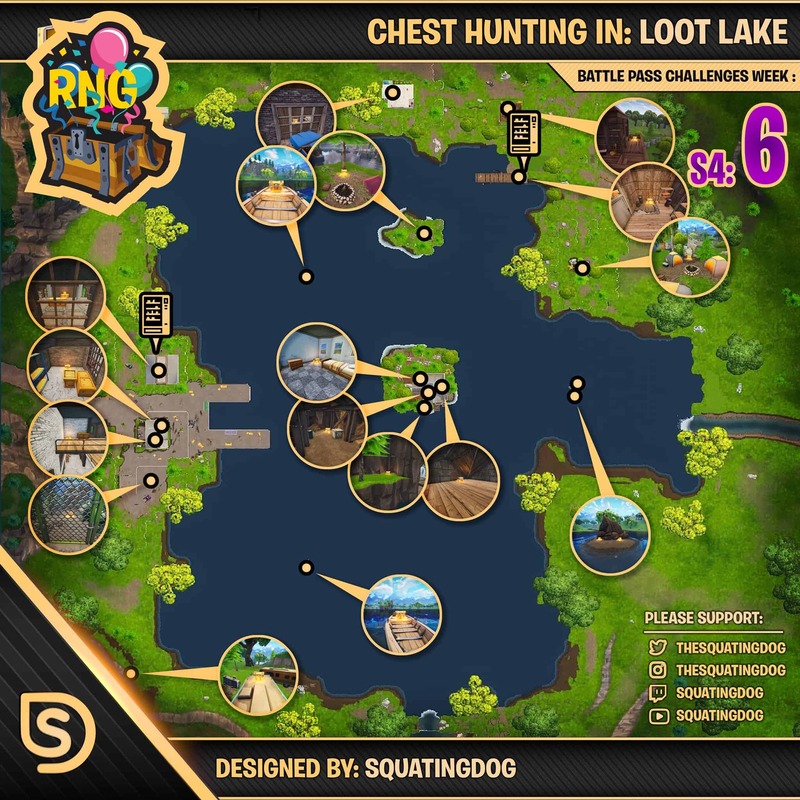 This challenge is simple — all you need to do is locate and search seven chests inside Loot Lake. Epic has given us this challenge before, so you may already be familiar with the chest spawn locations. If not, the map below will help you out. You don’t need to search all seven chests in a single match, so if you get eliminated, simply return to Loot Lake later and try again. If you’re struggling, wait a few days until others have completed this challenge and Loot Lake won’t be so busy. Here’s where you’ll find chests in Loot Lake. Epic considers these challenges “hard,” but they’re actually very easy if you know where to find the hidden Battle Stars. You’ll be heading back to Paradise Palms, specifically location H9 on the map, for this one. Check the map above — the one that also shows the location of the basketball hoops — for more details. Sniper rifles are some of the most powerful weapons in Battle Royale, but they’re hard to use if you don’t have decent aim. But we do have some tips to make this challenge a little easier. All you need is two sniper rifle eliminations. You can use the bolt-action sniper or the semi-automatic sniper. The former is more powerful, but the latter, which doesn’t need to be reloaded after each shot, might be easier to use for those who can’t quite hit their target first time. If you’re struggling with this challenge, jump into a game of duos, squads, or 50v50. Down enemies with a gun you’re more comfortable with, then finish them off with a sniper while they’re on the ground and unable to fight back. And remember, you don’t have to get both eliminations in one match. If you haven’t already completed all of week one’s challenges, we have a guide for those, too.